We partnered with the best European workloading and cleaning software company to bring you the most powerful cleaning software of this type in the world. Our software package has some advantages and Data Know How's software has others. If you wish to compare the two, we'd be happy to help. DATA KNOW HOW Cleaning Systems offers a graphical user interface where one works with floor plans rather than lists and text data. Established in 1987, over the years it's come to completely dominate its home markets in Scandinavia and, finally, iManage is able to offer an English-language version of this janitorial software here in North America.. 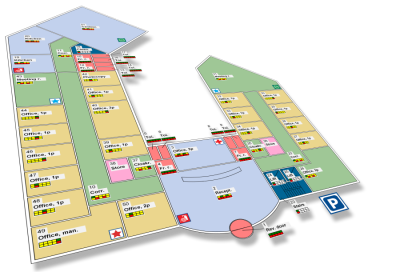 Floor plans are dynamically linked to the space inventory database. This allows, for example, the user to select a work assignment tool and simply click on rooms to assign them. As the user selects rooms, they turn a different color, corresponding to the color selected for the work assignment. This is also true of any other characteristic such as department or floor type. Space inventory "setup" can be performed at a rate of 15,000 SF/Hr (worst case, scanned floor plan) to over 30,000 SF/Hr (best case, Auto Cad dxf file). These rates are comparable to and often exceed the normal physical space inventory collection rate of walking and measuring with a 2-person team utilizing a laser measuring device. As rooms are "created" in the software, square feet and perimeter are automatically calculated. The software applies separate "use" and "floor" type cleaning profiles/standards for quick adjustment and changes and it can have an infinite number of either. It also has the capability of applying any number of cleanliness levels (cleaning frequency patterns), not just the typical five. Items within a room can be grouped and parameterized. This means, for example, that with one adjustment setting, the software can be set to differentiate between a one fixture washroom and a 10 fixture washroom since many items can be grouped (toilets, dispensers, stalls, for example). Hierarchy in the software allows multiple customers, sites, buildings, floors, and rooms. The list of technical specifications and capabilities is large and better left to demonstrations and discussions. Please contact us for more information. We would be happy to discuss your needs and/or demo the software.